EA Sports is making lots of changes to Madden NFL 16. You can now make quick adjustments on defense the same way that you make hot routes on offense. We’ll get to that and more but first, let’s watch some Madden 16 gameplay between the Giants and Cowboys. In the video above, we see Odell Beckham Jr. dominate the Cowboys secondary. Wouldn’t it be cool if you could assign your best defensive back to cover him all game? You used to be able to in Madden games a few years ago, but you won’t be able to this year. You just have to hope that whoever you have lined up against the other team’s best player can do a decent job of covering him. That being said, it will be harder to abuse the AI with glitches and money plays in Madden 16 due to the removal of some of the most annoying plays in Madden NFL 15. You won’t be able to hot route receivers on screen passes or automotion plays. Even though some of the plays like PA End Around won’t be in the game, there are already some plays that EA Sports is recommending in Madden 16. In this article Madden 16’s creative director, Rex Dickson, goes over one of the Madden tips he likes to use in the game. 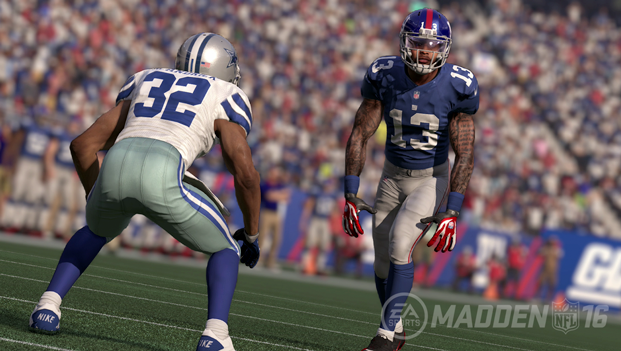 In case you are curious, you can check out the all of the newest Madden 16 details and features here. Before we go, let’s check out one final gameplay video between the 49ers and the Cardinals.